An extremely private funeral service for Peter Jennings was held earlier this week, attended only by family members. The funeral director revealed no details, except to say that only members of Jennings' family were in attendance. No details were released regarding when the service was held, who was there, or where Jennings remains would finally rest. Who Gets To Play Diva Katie and Balding Matt? David E. Kelley is ditching law for morning TV. He's creating a pilot script for a comedy-drama set behind the scenes at a network TV morning show. He pitched it to NBC, but they may have balked, considering the real morning show drama their Today show weathered earlier in the year. In a somewhat creepy survey, researchers have determined that TV queen Lucille Ball is America's most beloved dead star. The company that developed the "Q score" did the survey, testing the reputation of performers who have gone toes up. Actors are only eligible if they're physically, not metaphorically, deceased. Sorry, Tom Arnold. Mark Burnett's The Contender, the much ballyhooed boxing reality show wiill return for a second season- on ESPN. The show, shitcanned by NBC due to low ratings, will return to the all-sports cable network sometime in 2006. The new deal makes ESPN a partner and would allow the network to pick up two additional seasons. 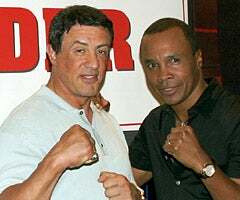 Sylvester Stallone and Sugar Ray Leonard remain partners in the series.